If you are fortunate enough to visit Turkey at some point in your life, it won't be long after you arrive that you will be tempted, or more likely cajoled, into buying a Turkish rug by a salesman skilled in the art of persuasion. Typical tourists are likely to think, "Aha, this is a scheme to transfer our tightly held dollars from our hands to those of a Turkish rug seller." And they would be correct. Yet there's more to the story than that. They say knowledge is power. This is true in many, many cases. After you attend a Turkish rug demonstration, the knowledge you acquire may render you powerless to resist the opportunity to buy an original, handmade, one-of-a-kind rug guaranteed to outlive you. Just don't rush to buy that rug until you know a bit more. On just about every tour of Istanbul and Turkey’s smaller cities, you will be “invited” to a Turkish rug sales demonstration. These are typically led by charming and hospitable salesmen who warmly greet you and offer a complimentary beverage; chai and Turkish coffee are most favored. For thousands of years, Turkish rugs have been the gold standard in floor covering everywhere from nomadic huts to grand palaces. The big difference between a one-of-a-kind Turkish rug and those sold at your local housewares or carpet store for little more than a hundred dollars is that Turkish rugs are all made by hand. A good machine-made rug may last for decades. A Turkish rug will last for hundreds, if not thousands, of years, becoming a family heirloom passed down for generations. There are many examples of Turkish rugs found intact after millennia. Turkish rugs are double-knotted. Each piece of yarn is looped twice through the weft, making the rug sturdier and more durable. Rugs elsewhere are tied with a single fiber per vertical thread. Turkish rugs can be made of silk, wool, or a wool-and-cotton blend. Dyes are all natural, using everything from rose madder to indigo to onion skin to attain subtle organic colors. The most valuable, beautiful, and costly Turkish rugs are made of silk threads. Although they are filament-thin, they are one of the strongest natural materials known to man. Typically, silk carpets hold 400 threads per inch. An expert weaver can knot many as 1200 silk threads per inch into a carpet. The number of threads per inch is a factor in a rug's value, along with its fiber content. One of the most fascinating aspects of learning about Turkish rugs is discovering that the silk used comes from cocoons rather than silkworms. Farm raised, then shot with steam to shock the incipient butterfly within, cocoons are then soaked in a vat of water. Using a wide brush, a worker teases out a hair-thin thread from each cocoon and affixes it to a spinning wheel that extracts all the silk from the casing. It is then twisted, dyed, and ready for weaving. Who Makes Traditional Turkish Rugs? The weaving of Turkish rugs is a traditional craft that young girls have taken up for centuries, taught by their mothers. Throughout Turkey, girls begin weaving in order to prepare goods for a traditional dowry and trousseau. In recent years, the Turkish government has sponsored through its Board of Education schools where girls can enroll in a weaving course. Students come on a daily basis to better their skills and consequently earn more by producing finer rugs. These schools are located across the country, and most are attached to a sales operation, where a customer can buy a rug directly from the place where it was made. The largest of these is outside the port city of Kusadasi, near Ephesus. Considering that Turkish rugs last more than a lifetime, these sales offices also accept and sell used rugs, which are noted as such. On a recent visit to one, we also saw beautiful rugs that had been woven by nomadic women. Regardless of its vintage and its condition, a fine Turkish rug is valuable and its worth may increase over time. Turkish rugs are sold throughout the country, but it is important to buy yours from a reputable dealer/authorized agent so that there will be no doubt about the materials, age, and provenance of the rug. In Istanbul, the clean, modern, well-lit Istanbul Handicraft Center is filled to the rafters on several floors with knotted Turkish rugs and woven kilims. It is a freestanding store located on the main walkway that leads to the Grand Bazaar. 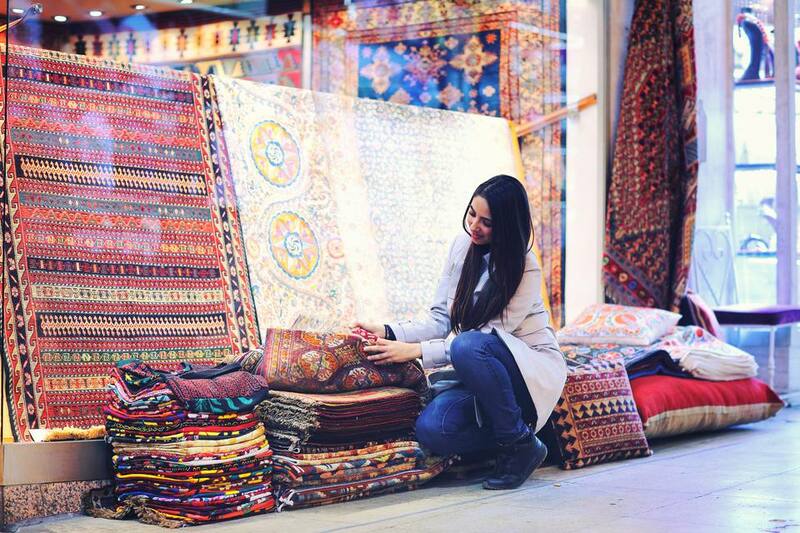 After you've sipped your chai, the salesman will ask what type of Turkish rug you are interested in - size, colors, style - and enlist the help of burly assistants, who bring out a series of rugs to unfurl with a thwack at your feet. In case the Turkish rugs there don't seduce you, the exquisite and precious designs in the jewelry store on the lower level of the Istanbul Handicraft Center may. Turkish rug prices are not necessarily based on size. The number of knots per inch has the most influence on the cost of a Turkish rug. Typically, silk carpets hold 400 knots per inch. Wool and wool-and-cotton blends accommodate fewer knots and are relatively cheaper. A tightly woven, intricately designed silk rug not much bigger than a sheet of paper may cost more than a woolen carpet big enough to cover a living room floor. Prices of small woolen or wool-on-cotton Turkish rugs start at a few hundred dollars and range into the thousands. If you find a rug that you love, should you haggle over the price? Absolutely! Consider the initial price simply a starting point. After some back and forth, offers and counter-offers, you may be able to acquire your Turkish rug at a price somewhere between 30-40 percent less than the initial quote. As you discuss price, ask if wrapping, shipping, and insurance are included. You may also want the seller to affix hooks to the back of the rug if you prefer to display your purchase on the wall as a piece of art rather than allow people to walk upon it. Regardless of price, Turkish rugs are made to be used. Increased foot traffic only strengthens them. It's advisable to discuss cleaning with the seller and ask if there are special instructions. That said, a Turkish rug can be vacuumed daily, if you so desire. Most stains can be removed using a gentle mixture of baby shampoo and water. Some owners prefer to have their Turkish rug professionally cleaned. If you're furnishing a room and can't get to Turkey, there are reputable places in the USA that sell Turkish rugs. 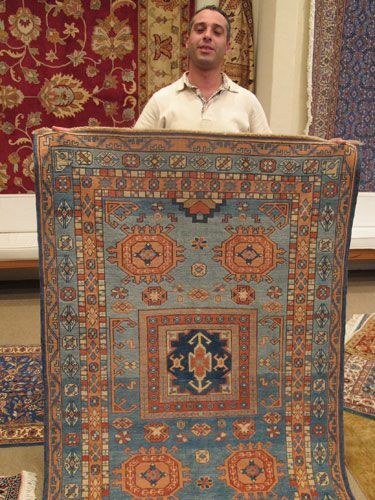 One excellent option is ABC Carpet in New York City, which sells vintage Anatolian (that refers to the Asian part of Turkey) rugs. Although haggling isn't encouraged, sales take place throughout the year. Obviously, the best place to buy a Turkish rug in terms of selection and price is Turkey. Ready to go?